I own a PS3…spent over $1000 on the system, hard disk upgrades, controllers, cables, and games…but I’ve still clocked more hours on free online flash games than I have on my PlayStation. Go figure. This weekend has been a productive one, though not in the way that I planned. I couldn’t concentrate on school and needed some good distraction. Sav was good enough to let me play a good amount of Dead Space 2. I even turned down the headphones, when I enjoyed just as much as she did. Dead Space 2 (and Dead Space) are games that I love. They are so immersive and well made. There’s nothing quite like the first play through, were you learn the story for the first time. That hasn’t stopped me from playing them over and over. I’ve probably played Dead Space four or five times already. I’m only on my second playthough of Dead Space 2. Life got a little busier, and I don’t play quite as much. Even though I know just about where every enemy will come from in Dead Space, I still love playing it. I don’t quite have Dead Space 2 known like that, but probably some day. I’ve played a lot of fun games, but the games that I play again and again (which obviously must be the most fun) are the ones that combine great gameplay with great storytelling. If it doesn’t have a great story, I’ll probably end up trading it in at GameStop after the first playthrough. If I finish the game thinking, “Wow! I can’t wait to play that again,” it will probably stay on my shelf forever..
That’s how I would describe Minecraft. It’s Sunday, on a 3-day weekend, so I decided to spend some time playing a game this evening. Since it is Sunday, Dead Space is out of the question. So I decided to revisit my little world in Minecraft. I’ve made a few different worlds. The great thing about Minecraft is that it’s still being developed and the developers are adding new features every month or so. The only downside is that to get some of the new features (if they involve terrain/world generation) is to create a new world. This is the pits, because my coolest world is probably the first one I ever started. (Granted, I did cheat and give myself some cool items to make some cool contraptions, like a giant door to my house/base of operations and a bunch of other doors, but it’s still the coolest.) Or there’s the world that I decided to build a giant underground room filled with trees, and spent hours hollowing out the earth to create it. It also had an awesome mine cart track that used “boosters” (since “fixed” (removed)) to visit the caves. But since the release of Minecraft 1.0, I’ve started in a new world, not cheating, and trying to play with a purpose, but still having fun and creating. That’s the fun part of Minecraft. There doesn’t have to be any more point to the game than simply playing. You can play to explore, play to hunt creepers and zombies, or play to create. I like to explore, create, and survive. So if you’re into video games, and you want a game that will give you endless hours of fun, allowing you to explore and create in a uniquely generated world, look no further. It’s how I spent this evening. And it was fun. I like, possibly (probably) even love, video games. It’s been this way ever since I played my uncle’s Nintendo Entertainment System, then his Sega Genesis, then my Nintendo 64, then my PlayStation 2, to my PC desktop, all the way to my current PlayStation 3 and Windows laptop. Sav, on the other had, does not love video games. She has fond memories of just a few, and loathes a few others. She likes when I play with headphones, especially if I’m killing necromorphs or anything with repetitive gun sounds. She did watch me play Bioshock 2 and thought the story was awesome. And it was. (Bioshock 1 has an even better story.) Dead Space is another great game, great atmosphere, but not the kind of game she’d care to watch. But recently, I got her to play a simple smash-em-up game called Castle Crashers, and it’s been fun. I also got her to play some LittleBigPlanet, and I should probably get the second one too. The games she’ll play with me may not be my favorites if I’m playing alone, but playing together is tons of fun. Some day, I’ll get her to play Minecraft and Portal 2 too. (And hey, some day, far, far away, maybe someone will play Left 4 Dead (2) with me.) We’re working up to it. 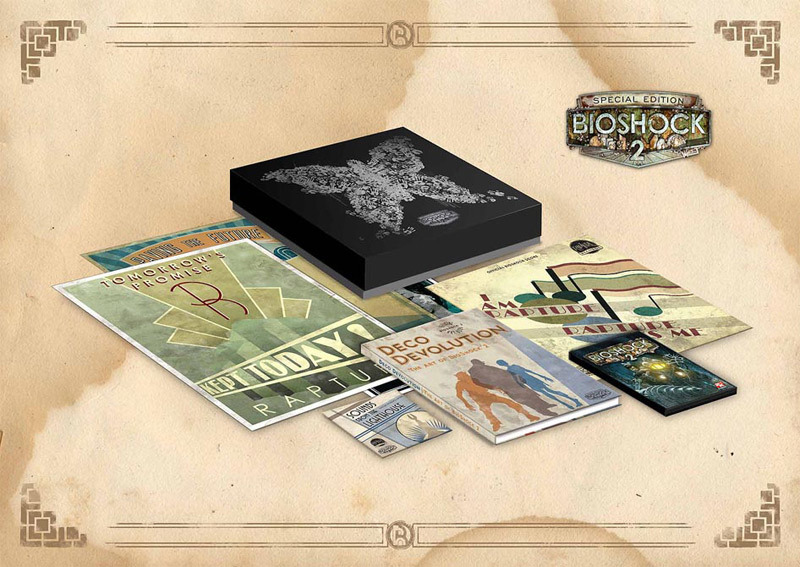 This week, along with getting new Phones, Sav let me get a half-birthday present: Bioshock 2. She even let me get the special edition, which is probably the coolest thing I’ve ever owned. I bought it on Tuesday. I didn’t play it until Saturday. That tells you a few things: a) how much homework I had to get done during the week, and b) how much marriage has changed me. If this had been my single days, I would have finished that homework by 11, and I would have played Bioshock 2 until 6 in the morning when I would notice the sun outside and make a mental note that I wouldn’t be going to class that day, and that when I get up to use the bathroom, I should send an email to my boss telling him that I’m ill today. Instead, I went to bed by 11. I also skipped class, but no Bioshock. This weekend, Sav confirmed that she is indeed the coolest wife in existence. She not only said, “You should play your game.” She sat down and watched me, and when she learned the back story, kept saying, “This is the coolest game.” Legit. I started playing on Saturday, but only after I’d beaten this game. Oh, I’m so hooked on flash games. I’ve only played a few hours, but it’s definitely just as good as the first. Only this time I haven’t spoiled the story line by reading the Wikipedia page. (Did that on the first game. Silly CK.) I can’t wait to get more free time to play. Oh–it’s such a good game!